One can find many hidden treasures on the island of Mallorca, little known places that the tourist can enjoy also throughout the year, not just during the warm season. 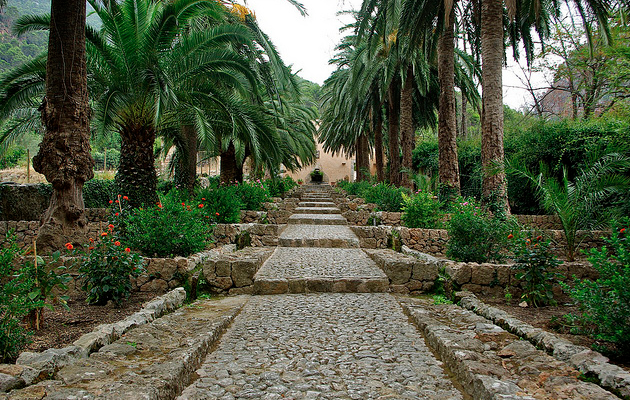 One such treasure are the Alfabia Gardens located by the entrance to the Soller tunnel, in the Sierra de Tramuntana mountains. 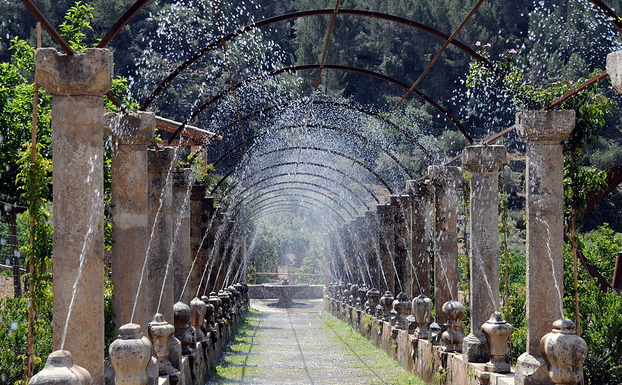 A legacy of the Arab talent for landscaping and irrigation, the farm is the property of the famous Mallorquin family Zaforteza since the beginning of the 18th century The origins, however, are set at the beginning of the 13th century, when the Arab viceroy Ben-Abet was using the ancient Muslim farmhouse as residence. The original name of the farm derives from al fabi, 'jar of olives' in Arabic. Throughout the years the complex (made up of the garden, a senorial house and an orange orchard) has been preserved and renovated in the attempt of keeping its original splendour. Particularly recommended is a visit in the hours of the early morning, when the gates have just opened. Then the sun is coming up in the back of the Alfabia and its light transforms hundreds of fragrant wisteria flowers in a bright blue blossoms rain. And even with a large number of visitors, one can always find a quiet corner to enjoy the song of the water fountains and the beauty of the flowers. More information and the opening hours can be found on the website of the gardens.